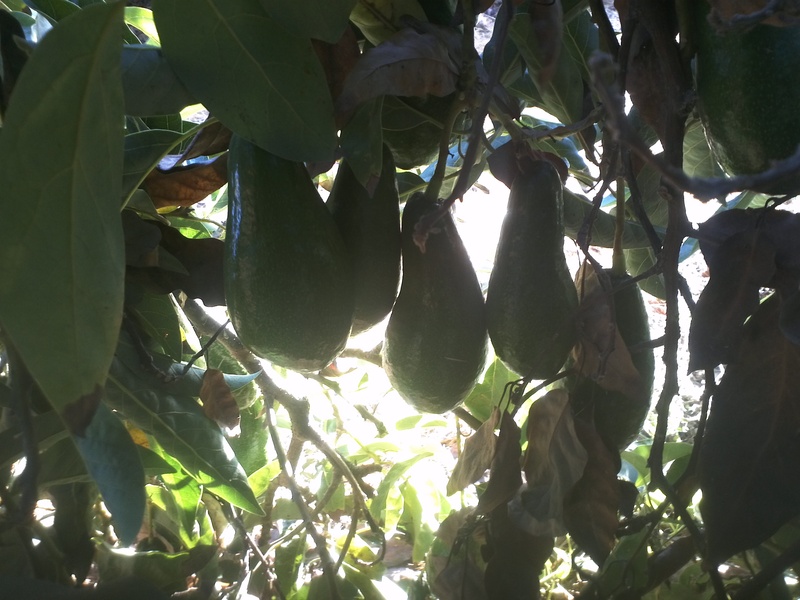 A few weeks ago, I was re-assigned from working in the Bustan (literally “orchard,” actually a tropical garden of sorts) to working in the extensive Avocado fields. The job has me working from 5:30am to about 11:30am, with bouts of avocado picking broken up by coffee and meal breaks. Overall a really delightful job, challenging, interesting, and meditative. Not all the branches of the tree are living. In fact, there are many, many dead ones. When inside a tree, you’ll see both live branches with leaves and avocados, springy and greyish-tan, and dead branches, gnarled and pointy, dark brown, leafless. As someone who spent many years among the hippies of Berkeley, ravenously absorbing the mentality that nature grows according to a diffuse intelligence greater than ours which humans arrogantly but futilely try to predict and master (read Daniel Quinn’s Ishmael for a good primer on this outlook), I assumed that trees would grow such that all branches were alive and contributing to the tree in a kind of elegant balance. I was surprised to find so many dead branches, and I tried to understand what was going on. One thing I discovered (much to my delight) was that these dead branches are very easily broken off, and that the removal of dead branches from the tree seemed to improve the overall health of the tree. Indeed, the dead branches seemed to block light from the inside of the tree, almost “clogging up” the tree’s sun-leaves-branches pathway of photosynthesis. As I broke away the dead branches and cleared out the “inside space” of the tree, I felt (forgive my new-age indulgence) an almost spiritual release of tension, a sort of exhale, a surge of ambient clarity. I felt like I was opening the windows of a stuffy room. It should come to little surprise to you, dear readers, that clearing the dead branches from a tree became my favorite part of the avocado-picking job. Every time I got to a new tree, I would spend a good five minutes looking around for dead branches I could clear away, and felt little rushes of pleasure whenever I broke away a particularly large branch. If you’re the kind of person who likes cracking your joints, you understand the kind of sensation I’m talking about. For you marxists, environmental designers, and political economists, the concept of “creative destruction” can be loosely applied. By breaking away the dead branches, I was creating space for sunlight to enter new parts of the tree, creating a new abundance of a resource that the tree could exploit to grow new branches. I was still unclear, however, as to why a tree should end up with so many dead branches clogging itself up. After a few trees, I formed a hypothesis: the tree grows branches in order to harness as much solar energy as possible to carry out its photosynthesis. Wherever sunlight shines on a tree, the “dumb processes” governing the tree’s growth start to activate and begin the long process of growing new leaves under that sunlight. Lacking a central intelligence, however, the tree is unable to identify which single branch is optimally positioned to grow into the sunlight. Instead, multiple parts of the tree start growing towards the light. Over time, as multiple branches start to grow, one will find itself better positioned, and will start blocking the sunlight from the other branches (much in the way one sailboat can “dirty” the wind of another). The unfortunate shadowed branches will find themselves quite without a purpose–the light they had been growing towards has (to their perspective) quite mysteriously vanished. Lacking sunlight, those young branches will wither and die, eventually becoming the brown, brittle branches that I was snapping off with joy. This same process is occurring across multiple levels of the tree–from small twigs competing for light at the end of a large branch, to large branches competing with each other for entire regions of sunlight. The tree represents the sum total of these life-and-death struggles of light, as this constant struggle results in the optimal amount of light going to the tree… almost as if the growth is being guided by an (dare I say it!? )… Invisible Hand. The hypothesis led to others. These trees evolved without the benefit of zealous avocado pickers to come along and act as spiritual cleansers. The fact that the dead branches deteriorated to such a brittle state is likely to have served a purpose: as wind and rain would weather on the tree, the dead branches would find themselves knocked away. I was simply expediting a process that would have occurred much more slowly without me (going back to the Ishmael idea from earlier: was I “helping” nature along, or arrogantly accelerating a process that should be taking place much more slowly?). I was very pleased with this new perception of the life process of trees. But the best was yet to come. Something about this hypothesis of mine, that trees grow branches which end up competing with each other resulting in the optimal configuration of branches, was not entirely novel. I had read about a similar process elsewhere… taking place in the human brain. The current theory of neurogenesis (the growth of neurons in the brains of infants) goes something as follows: rather than our DNA encoding the incredibly complicated arrangement of neurons necessary for our brains to function properly, we simply grow far too many neurons in our first months of life and prune away all the ones we don’t need. In the words of the famed neuropsychologist Donald Hebb, “Cells that fire together, wire together.” In other words, when a neuron is getting stimulated, it gets stronger. If it stops getting stimulation, it dies. Rather than know in advance that the brain needs to connect the eye to the occipital lobe (where the brain does visual processing), the growing brain connects the eye to everything and then over time the “wrong” connections die off due to lack of stimulation. It’s an elegant but somewhat counterintuitive solution to the problem of how something as complicated as our brains could come into being. Another instance of how a “dumb process” can result in a highly complex outcome. The similarities to the tree are remarkable. Both are mechanisms of solving complex problems of growth to maximize the efficiency of using resources, using only dumb processes without the benefit of a central coordinating intelligence. Both involve overgrowth and rely on a built-in pruning mechanism. Both result in fairly optimal outcomes. Even the physical patterns (branches and neurons) resemble each other. And yet they are made of entirely different materials, and rely on entirely different sources of stimulation. This article is truly a fastidious one it assists new web viewers, who are wishing for blogging.